Our heavy-duty pallet forks offer a step on each side of the pallet fork frame for easy entry into and exit from the skid steer. fork tips. 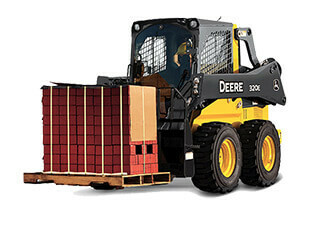 Heavy-duty forks can be positioned 8-60 in. (203-1524 mm) wide in 4-in. (102 mm) increments. Like all Worksite ProT attachments, these pallet forks are optimized to work with John Deere Skid Steers, Compact Track Loaders, and Compact Wheel Loaders, and are compatible with most competitive models.